Congratulations to Ramtin Doroodchi from Fannin County High School (FCHS.) Ramtin has completed the Engineering Pathway at FCHS and passed the NOCTI certification test in Pre-Engineering/Engineering Technology. Ramtin scored 16 points higher than the national average on the exam! 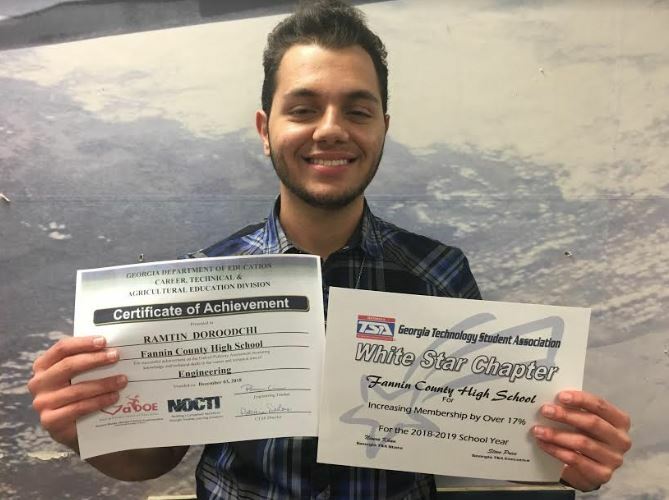 Ramtin is currently serving as the President of the FCHS Technology Student Association (TSA.) At the Fall Leadership Conference in Jekyll Island, Ramtin accepted the White Star Chapter Certificate for increasing the TSA membership at FCHS by 17% over last year. Ramtin has applied to Johns Hopkins University and Georgia Tech, and he plans to pursue a degree in Biomedical Engineering.